Allie Goertz (MAD Magazine/ Everything’s Coming Up Simpson podcast) moderated the panel discussion that followed with creator Matt Groening, showrunner Josh Weinstein, and cast Eric Andre, Nat Faxon, John DiMaggio, Billy West, Maurice LaMarche, Tress MacNeille, and David Herman along with Claudia Katz from Rough Draft animation studio. 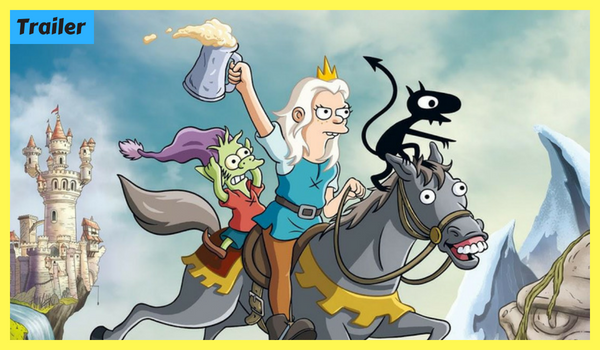 From the mind of Matt Groening comes the 10-episode adult animated comedy fantasy series, Disenchantment, launching on Netflix, August 17, 2018. In Disenchantment, viewers will be whisked away to the crumbling medieval kingdom of Dreamland, where they will follow the misadventures of hard-drinking young princess Bean, her feisty elf companion Elfo, and her personal demon Luci. Along the way, the oddball trio will encounter ogres, sprites, harpies, imps, trolls, walruses, and lots of human fools. The series will feature the voice talents of Abbi Jacobson (Bean), Eric Andre (Luci), and Nat Faxon (Elfo) along with John DiMaggio, Billy West, Maurice LaMarche, Tress MacNeille, David Herman, Matt Berry, Jeny Batten, Rich Fulcher, Noel Fielding, and Lucy Montgomery.